Looking for a sweet way to show your gratitude? You've found the ultimate reward with a Chocolate Covered Almonds in Wooden Collector's Box. We’ll tell you flat out: These are the biggest and finest chocolate almonds we’ve ever seen. In fact, they’re so superior to what you’ll see in stores that your customers and employees will call asking where you found them. Colossal, freshly toasted California almonds are covered in rich chocolate! 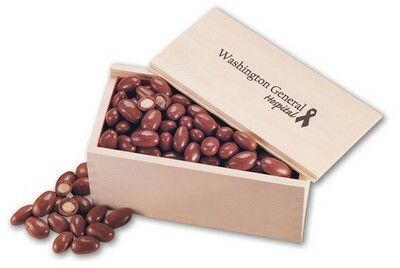 Over 75 come packed in this three-quarter of a pound gift box with your logo firebrand imprinted onto the lid. What an excellent holiday gift! Click on the location(s) where you want your fire branded logo to appear.